I keep being distracted by my doodling and then start on something else lol. I like the small black marks in the bottom left corner – reminds me of burnt matches… plus the ‘brain shell’ pattern on the rights – the small yellow ‘moon’ shapes came from a flower photo. quick photoshop play with the ‘shell brain’ sketch… rather like it and will try a proper version soon. 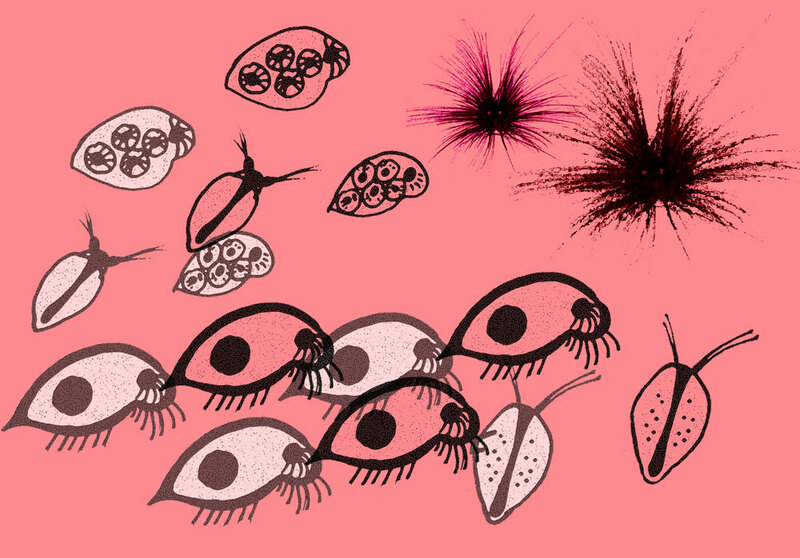 sea fleas and urchins sketch – separated onto different layers in photoshop… like the shape of the fleas… the sea urchins I would like to re-do in illustrator in stylised lines. I hope to find one that I can deconstruct for another class exercise. A tiny book but brilliant inside – comes with a DVD but my iMac loathes reading CD/DVD’s and just vomits them back out. Half drop repeat (I think), graphic and contemporary. Does this count as a 3 colour print? I also bought this book on Amazon – only received that today (5th April) it comes with a CD with 50 copyright-free patterns… stupid iMac DVD drive… I really need to fix that.